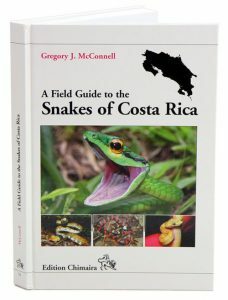 A field guide to the snakes of Costa Rica. 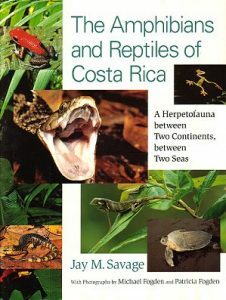 With contributions from numerous herpetologists from around the world this guide provides more than 550 colour photographs to identify the 138 snake species occurring in Costa Rica. Distribution maps are included for all species as well. This small, useful and easy-to-carry tool is a must for every nature enthusiast travelling the region. Each of the species accounts, for the 396 species, synthesizes and analyzes everything that is known about the animal’s anatomy, behaviour, geographic distribution, systematics, and evolutionary history and provides keys for identifying amphibians and reptiles in the field. In addition to distribution maps and systematic and morphological illustrations, the book includes colour photographs of almost every known species. 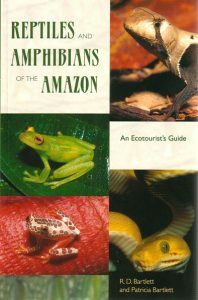 Reptiles and amphibians of the Amazon: an eco tourists guide. Artist/Author: Bartlett, R. D and Patricia Bartlett. A colourful, easy to use guide to more than 250 snakes, lizards, turtles, frogs and salamanders common to the Amazonian regions of Peru, Brazil, Bolivia and Columbia.